Meri Rosich has worked around the world, in New York, London, Barcelona, Hong Kong and Singapore, for top global firms such as American Express, Bertelsmann and Samsung, leading product innovation, strategy and marketing teams. Outside work, she enjoys mindfulness and sports and spending time with her family and kids. She holds an MBA from the London Business School and a PhD in 3D technology. She also advises technology start-ups, mentor incubation programs, and is passionate about equality and diversity. She has been at the Board of the United Nations Association leading the Women's team, volunteers as Ambassador for the UN Women STEM program, and is co-founder of FemaleFounders.com. What does the term TCK mean to you? Do you identify as being a TCK (why/why not)? I’ve been out of my country for the past 15 years and I see my kids growing up very far from their home cultures. I’m working with TCKs to help them keep the links and connections to their original culture with technology. Being a TCK means feeling like a citizen of the world, keeping my own culture but at the same time following and enjoying other cultures. What are the common attitudes and behaviours of TCKs that impact our relationships at work, at home and in love? I guess after 15 years, when I meet TCKs, the people that have traveled and learned about and appreciate other countries, I appreciate the fact that they are very open minded. They have the wonderful ability to understand other cultures and adapt to change, which is one of the most important things we can help our kids to develop. 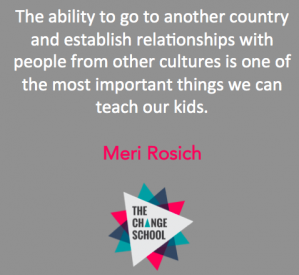 Having the ability to go to another country and establish relationships with people from other cultures is one of the most important things we can teach our kids. How does the age factor play into these spheres? I feel this is about how easy it is to adapt to change, and it is really easy for kids when they are young and in international schools where TCKs move in and our of other countries almost painlessly. When you get older however it is a bit more complicated as they attach their identity to their friends, which I’ve seen from around the age of 8. They just celebrated international culture day in my kid’s international school and it was wonderful to see the children still talk about the culture of their parents whilst they are moving around. You get the sense that they are truly global kids, which is great to see. What challenges do families face with raising TCKs and what are some best coping practices? We find it hard, not on our side, but sometimes for people on the other side to understand what our kids go through. Our kids come back to our home countries and it is sometimes hard for them to fit-in, perhaps not understanding some jokes and so on. We do our best to cope as best as we can, we celebrate cultural traditions of our home country; we keep in touch often with family and friends and do it in the sense of normality – making it as normal as possible for our children. They are growing up with 5 languages but we try to make this absolutely normal for them. Where can adult TCKs find support systems? I think as a TCK, I find lots of support on social networks. When I moved 15 years ago there weren’t any online networks, joining groups now helps you to integrate. It is so easy to join support networks and it is a lot easier to find them – it is now common to be part of this culture around the world. I think now is one of the best times to travel the world. I hope that some of these answers can be helpful. In my career, we help long distance families spend more time together virtually. We find that grandparents and kids sometimes get bored or have connection problems over video conferencing and we help long distance families become more engaged with technology. Helping maintain family bonds across the world. It is a fascinating area to explore and to see how technologies can help TCK families create closer social bonds.